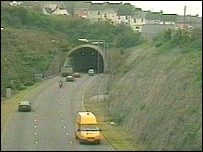 The Saltash Tunnel was closed while a major emergency response exercise is held. The Highways Agency and its partners have produced an emergency plan as part of recent upgrade work to respond to any major incidents. The exercise on Sunday night involved more than 200 people and test emergency services' and agencies' responses to any such incidents. More than 38,000 vehicles use the tunnel on the A38 every day. The exercise, Saltex 06, tested responses to a collision in the tunnel near the Devon and Cornwall border and involved a number of vehicles and simulated casualties. Highways Agency manager Nigel Dyson said: "In the last few years the tunnel has undergone significant refurbishment work to upgrade the control and communication systems and improve its visual appearance. "The Highways Agency and its partners have produced an emergency plan to respond effectively to a major incident in the tunnel aimed at ensuring the safety of users." The tunnel was completed in 1988 and is approximately 410m (1,345ft) long.